Sales has evolved over the last decade and today’s buyer is far more educated and sophisticated than before. The internet has been the great leveler here – in readdressing the balance between salespeople having had the upper hand and the buyer being, somewhat in the dark, when it came to making a purchase. Most buyer’s today are self-qualified and have arrived at their ZMOT (Zero Moment Of Truth) phase of the buying journey i.e. all they generally need is a little guidance from the seller, in finalising their purchase. For those buyers that are still undecided – they will require some information and insight which is relevant to their purchase, to help them make a more informed buying decision. Above all else – buyers just want to be handled with care and consideration! The day of the old pushy ‘foot in the door’ salespeople proverbially pinning a buyer up against a wall – has gone (even though I still experience this today). Sellers now have to be more mindful, not just about how they sell – but also about what the buyer actually wants (rather than what the seller thinks the buyer wants). A modern seller has to be conciliatory i.e. prepared to compromise in any negotiation. They need to be empathetic i.e. really appreciate the needs of the buyer and their situation. They need to be good active listeners i.e. fully appreciative of what the buyer is saying (or not saying). They need a high level of knowledge and acumen i.e. so they can really understand the customers’ macro-picture as well as their micro-picture and offer advice accordingly. Finally, they need to adopt a more neutral style of selling – which centres on the 3 C’S i.e. being more Conscientious, Considered and Caring. Most salespeople still use ‘push’ techniques or ‘pull’ techniques to take the customer along their buying journey and both of these involve a certain level of coercion and force. Whenever you use a force e.g. push or pull – you normally get resistance. Newton’s Third Law states that ‘For every action, there is an equal and opposite reaction’ and the same can be said for sales i.e. the reaction to the force used by a seller – is the resistance the customer puts up! The harder the seller pushes or pulls – normally the harder the buyer resists (in at least equal measure). Today’s seller has to be more conscientious, considered and caring – when it comes to dealing with a buyer and neutral in their selling style. Sellers also have to be more educated and reflective – so they can give their buyers the information and insight that they need, as and when the buyer needs it. Certain elements of mindfulness are very relevant to today’s seller. Mindfulness is all about being in the moment or being aware of something. 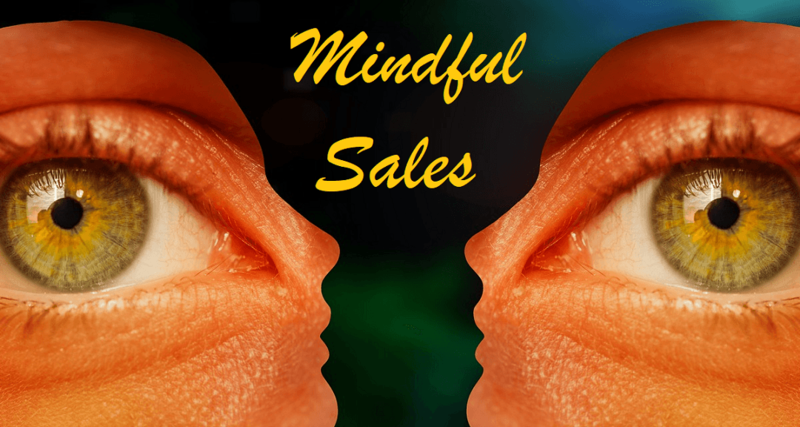 Mindful sales is about being in the head of your customer and being aware of their specific needs, challenges, issues, and problems – and then guiding them along an influential path to resolution (but without using tangible force). You don’t need to chuck the baby out with the bathwater and the traditional, well-proven sales strategies, processes, methods, and techniques of the past – still have a place in today’s modern selling world, but they have to be modified and made fit for purpose. If a seller isn’t mindful about how sales has now evolved and doesn’t evolve their own selling style accordingly, then that seller will probably find that their customers are more minded to go elsewhere!